wood decks and bridges, array of natural stones and rocks and in plantings spanning evergreens to hydrangeas, underscores the mindful simplicity of the surroundings. The water features at the front and rear entrances to the home set the stage for a soothing, welcoming and laid-back contemporary style. The water features correlate with the house's linear design and also provide a place for respite and mediation. Connectivity in a linear space was provided by natural stone walkways, which soften any potentially hard or angular visuals and link together access points to the home and multiple gathering areas. Also lending visual lushness and texture to those walkways are pockets of plantings embedded between steps. Chalet designers tackled another high-priority item on the owners' wish list: spaces for entertaining. An elegant and eye-pleasing built-in fire pit is one gathering area. A separate seating area off the back of the home is often used for al fresco dining and casual get-togethers. The landscape reflects form and function in other ways, namely in the homeowners' fondness for their three dogs. A broad lawn provides ample space for running and retrieving, in the case of some of the dogs. 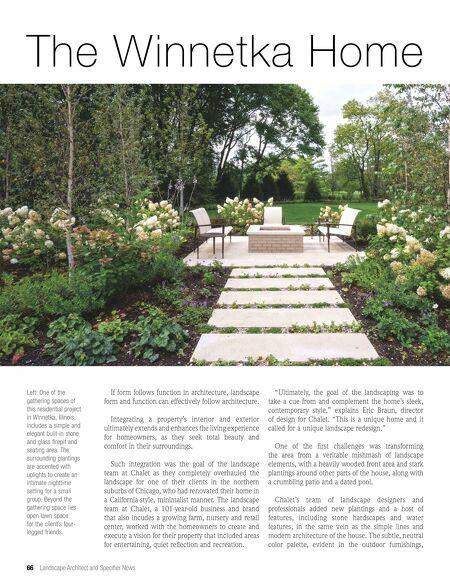 It was important to the owners to have areas of their backyard that are friendly and conducive to their pets as part of the family living experience. 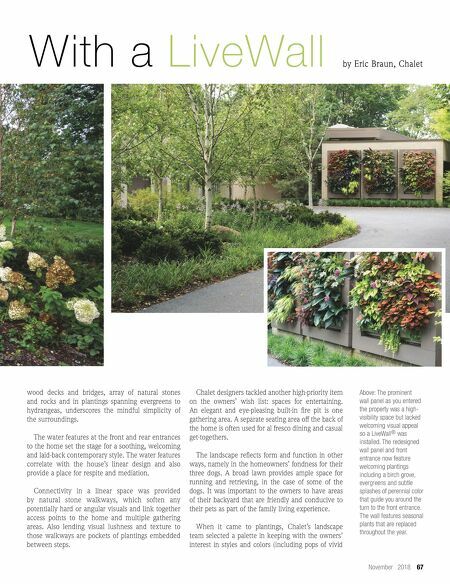 When it came to plantings, Chalet's landscape team selected a palette in keeping with the owners' interest in styles and colors (including pops of vivid November 2018 67 With a LiveWall by Eric Braun, Chalet Above: The prominent wall panel as you entered the property was a high- visibility space but lacked welcoming visual appeal so a LiveWall ® was installed. The redesigned wall panel and front entrance now feature welcoming plantings including a birch grove, evergreens and subtle splashes of perennial color that guide you around the turn to the front entrance. The wall features seasonal plants that are replaced throughout the year.